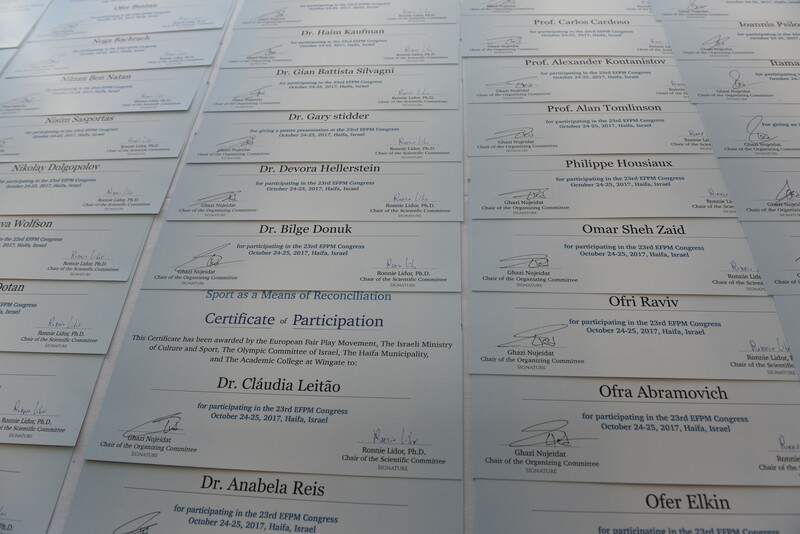 In order to assess the effectiveness of the EFPM Congress the scientific advisory committee(SAC) was again asked to carry out a survey of key delegates in order to evaluate the event and make recommendations for future improvement. An on-line survey was designed with the approval of the committee and the organisers, based closely on the evaluation carried out of the 2015 and 2016 congresses in Baku and Vienna. The 2015/6 on-line questionnaire was modified again using “survey monkey” and sent by email to the list of attendees provided by the organisers. The key message coming out of the survey is that the annual congress is seen as an essential ingredient in the promotion of fair play, as part of wider programme supported by EFPM and partners. The programme for Haifa had been changed significantly from former congresses and this survey identifies that the new format was well received and very successful. Thanks go to the host colleagues for the effective implementation of this new approach. A strong theme from the survey comments was the value delegates placed on the learning, networking, exchange of ideas gained whilst also experiencing a sense of international friendship and cooperation. This on-line survey (average time to complete 5mins) was completed by 28 delegates, a 53% response rate, slightly higher than 2015 and 16. 100% of respondents felt that the overall themes of the congress and papers was current and relevant with positive comments that “for once all the papers kept to the themes” and “up to date with contemporary issues”. The only criticism was that the short papers were all from one country. 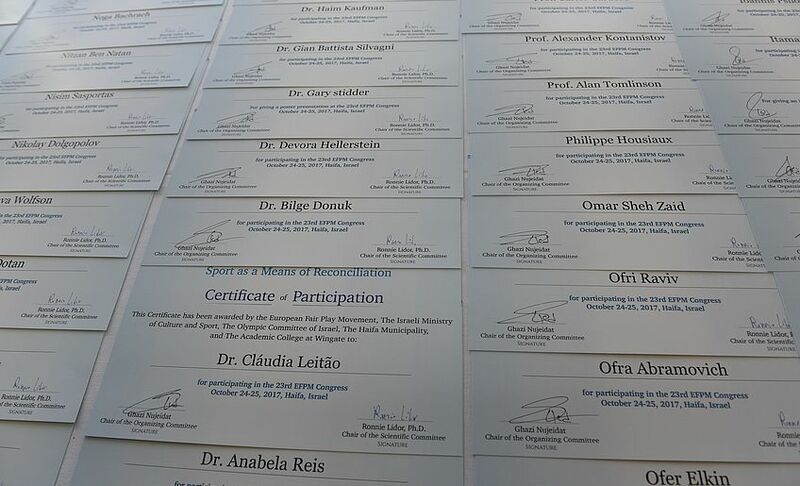 The congress programme and schedule of activities was felt to be good or very good by 96% of respondents! One comment was that “Strict program and strict time schedule combined with people's desire to cooperate gave an excellent result”. 96%, of delegates (compared to 75% in Vienna) rated very good or good the gala dinner and awards with one comment “Very good quality and a professional presentation”. For a first-time addition to any congress 96% of respondents agreed or agreed strongly that the practical physical activity session was relevant and enjoyable, with many positive comments about how enjoyable and different it was. (4 people skipped this question). 82%(Vienna 56%) agreed that the National Reports were effective in conveying information and practice, but some delegates never saw it. Again, respondents expressed disappointment in the number and quality of reports, with some suggestions that if this is important to EFPM it should be published on line annually from all members to a standard format. 96% of delegates felt the poster collection was interesting and helpful in knowledge transfer about aspects of fairplay one comment was “the option of posters submission as part of the scientific program opened the door for non-EFPM participants to attend the congress” It was also suggested that these be put on line. With regard to a further congress innovation, 92% agreed or agreed very strongly that the group discussion sessions were effective, engaging and informative. Overall comments were very positive, e.g. “quite a number of delegates did not take part, either due to poor knowledge of English or due to engagement to other activities. Nevertheless, this initiative was most fruitful and as a first the problems were limited” A number of people commented that the fewer questions given the time allocated would be better. Some respondents said that, whilst important, the themes of "equal opportunities; and promoting peace by sports; takes EFPM away from its unique and core business area i.e. fair play (behaving well in the game). 22% (21% Vienna)of delegates agreed very strongly and 70% (63%) strongly with this statement This could does reflect the quality of the papers, and posters but more likely the structure of the congress. The qualitative comments are of interest and reflect the qualitative findings from previous congresses, whilst many felt this depended on the individuals and was different in each country. Consider a stronger congress focus on fairplay on the pitch, in the game. In terms of improvements to the survey response rate, some people may have had language difficulties, as 9 were unopened, and of 43 opened only 25 responded, despite 2 reminders being sent. It may be better to ask delegates to complete the survey on paper at the end of the congress?